VIDEO IS SILENT. 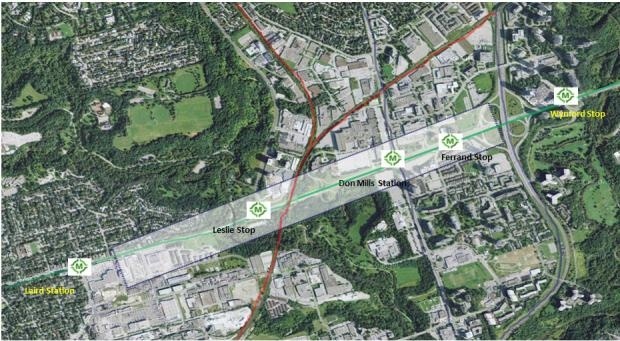 Eglinton Connects: Demonstration of how Eglinton can be 'greened' at the Don Valley. This video shows a section of the Eglinton streetscape at Leslie Street. The view is westward, with Yonge and Eglinton in the distance. The video shows the current street and existing trails through Serena Gundy Park. At this location, the Crosstown Light Rail Transit (LRT) reaches the surface through a portal (it will be underground heading westward). 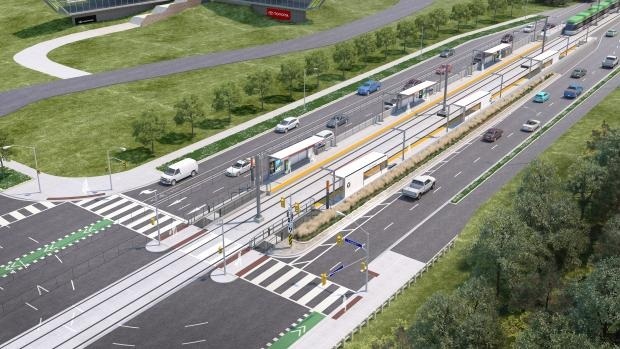 Although the LRT could run on a solid surface here, the Eglinton Connects team is working to achieve a planted green surface instead, which would better relate to the valley and improve the public realm. The intersection at Eglinton and Leslie will be redesigned to ensure traffic continues to flow, and transit users can access the green parks and valley. This includes ET Seton Park to the south, and Serena Gundy Park to the north. Safe bike lanes, separated from moving traffic, are recommended, and should be well connected to existing trails.